Garmin color moving map GPS 295 (coupled to autopilot) You can't help but notice the big, beautiful 16-color display on the GPSMAP 295. . The mapping details on the 295 provide a clear picture of what lies below. The careful use of color makes it easy to distinguish SUAs from highways, or VORs from nearby towns. Move the cursor to one of those SUAs and the name, controlling agency, and vertical boundaries pop-up on the map. Meanwhile a "vector to final" feature offers the finest situational awareness on approach. 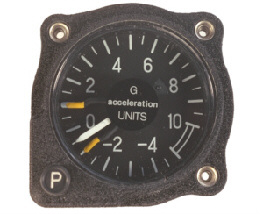 2 1/4" accelerometer (G-meter) for measuring and recording forces on aircraft. Resettable recording hands track maximum positive and negative loads. Mechanical operation, no electrical power required. 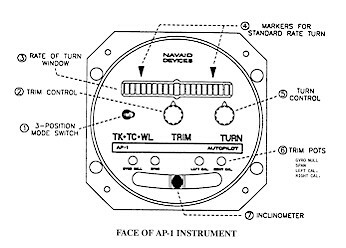 Autopilot - From NavAid Devices. A combination electric gyro turn/bank coordinator and wing leveler with a stand alone servo. Also couples to GPS and VOR for route tracking. Altitude Hold - From Cliff Cady. A very simple pressure sensing unit that couples to your elevator trim servo to provide a holding altitude. 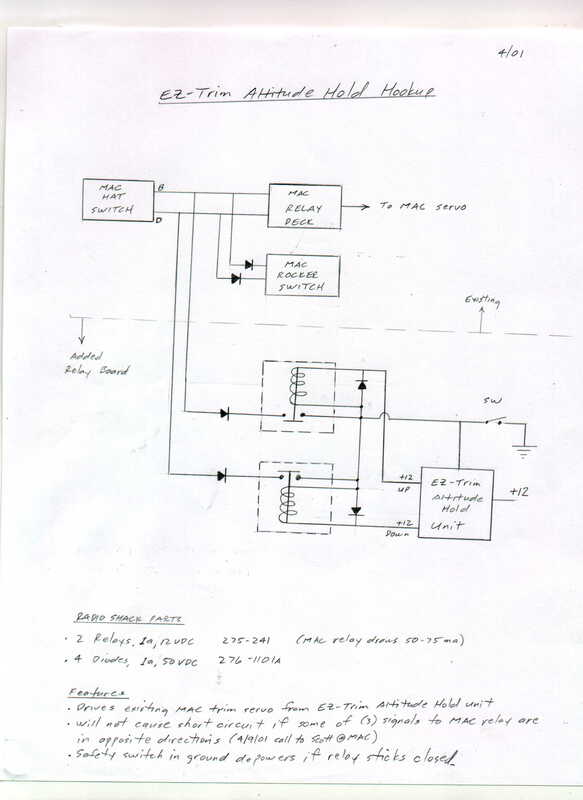 I did find that the unit was designed to apply voltage to activate a servo, which is opposite of how the Mac servos operate with a dual stick setup with the mac relays in there. . Here is the relay circuit I built to convert the voltage from the Alt. Hold unit to supply ground to the Mac relay system. 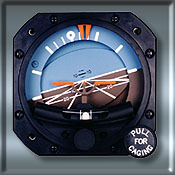 Engine Monitoring - From Rocky Mountain Instruments. The microMONITOR (left picture) has 22 different functions including manifold pressure, tachometer, exhaust gas temperature, cylinder head temperature, oil temperature, carburetor temperature, ammeter, voltmeter, oil pressure, fuel pressure and outside air temperature. An integral turbine-sensor fuel totalizer provides fuel flow, fuel quantity remaining and time to dry tanks. . 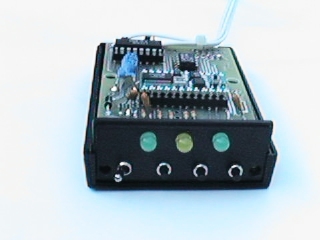 The microENCODER( right picture) is a mode C altitude encoder with a host of additional features. 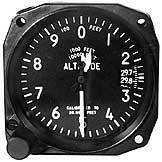 Using solid-state sensors and processing technology with a powerful microprocessor, the unit combines an altitude encoder with a graphic/digital vertical speed indicator, digital airspeed indicator, sensitive digital altimeter and digital outside air temperature indicator. 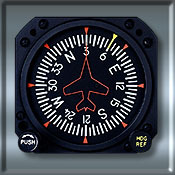 Magnetic compass heading is available with attachment of the optional compass module. Artificial Horizon - Sigmatek AH. Bought from E-Bay. Directional Gyro - Also from Sigmatek . Bought from E-Bay. Duel Fuel Gauge (capacitive) - From Van's. 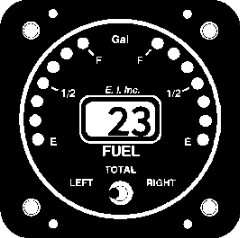 Single display; switch on front selects left tank, right tank or total fuel remaining on digital display. Displays simulated analog display for left tank and right tank. Calibrated during initial filling in 2 gallon increments to correct for sender position for very accurate fuel level readings. Available for either resistive or capacitive senders.